A Ritzian Interpretation of Variable Stars. This sub-section was pulled out of the basic document on 17 Jan 2002. Renamed and updated on 17 Dec 2003. Latest revision (Broken URL links identified] - 01 Apr 2019. Latest changes or additions are in bold. Key words: Gamma-ray Flash, Gamma-Ray Burst, stellar encounters, relativity tests. If memory serves correctly, of the first 24 detections of Gamma-Ray Bursts (GRBs), for which approximate directions to them could be established, 20 were daytime events. (It might have been 16 out of 20.) [Looking for misplaced reference.] (A daytime event, as used here, means that the angle between the line joining the center-of-the-Earth and the Sun, and the line from the center-of-the-earth in the direction of a given GRB, is 90 degrees or less.) 83 percent of the detections were day-time events. The purpose of the Vela satellites was to monitor worldwide compliance with the 1963 nuclear test ban treaty. One doesn't conduct secret atmospheric or outer-space nuclear tests at night, so, in the author's opinion, the preponderance of daytime GRB detections was suggestive of an experimental bias, i.e., we were looking most intently in the daytime. Could it be that explosions were being sought, and explosions are what were found? See: J. Bonnell's A Brief History of the Discovery of Cosmic Gamma-Ray Bursts. Using John Fox's extinction-limited version of Ritzian Electrodynamic Theory, the phenomena commonly called gamma-ray bursts (GRBs) can be interpreted as the result of information arrival time squeezing for close encounters of non-intrinsically variable stars. The flash for a given star (at locations remote from the center-of-mass of the interacting bodies) should be in a fan-shaped zone (That's not stated correctly. See note below. *), which is oriented perpendicular to the component's plane of motion, and on the opposite side from perihelion. The flashes are not intrinsic to either (or any) of the stars involved. (In the local vicinity of the interacting stars [where the minimum separation between the stars is an appreciable fraction of the system-to-observer distance] there will be no flash or burst observed.) See the basic article for a description of the physical process being discussed. Where the stellar paths involved are highly elliptical orbits, Ritzian relativity can be used to explain repeating gamma-ray flashes or soft gamma repeaters (SGRs). *Energy from any given GRB is not concentrated (or re-directed) in an angular sense. Ritzian GRBs result from time-wise concentrations of energy that would have reached a given point in any case. Fox attributed the extinction process, described as follows, to Richard Tolman(1), however Tolman dealt strictly with the abrupt change in speed of light upon its reflection from a mirror. -- Electrical charges in an environment absorb and re-radiate electrodynamic information (presumably by Rayleigh scattering) in a manner that leads to the extinction of the original information and to its replacement with a replica which travels at the speed of light c (in vacuum) with respect to the re-emission sources in that environment. If the original information happened to be traveling at a speed different from the "local"c, the replica will, so to speak, have the difference stripped off. Ritzian Gamma-Ray Bursts, as defined here, would constitute one phenomenological niche in the ever growing menagerie of variable stars. This article is an outgrowth of a way of thinking about variable stars, in general, posed by Vladimir Sekerin(2) in 1987. References to Tolman have been removed from the drawing. Since binary star close encounters are hypothesized here, we should expect to occasionally see evidence of eclipses which block out portions of the burst/flash light curves. Some of these will occur in such a manner that a given burst will start, (creating the precursor) then be blanked by the eclipse, (the eclipsing star being of larger diameter than the burst source), followed by an extremely short rise-time to near peak activity (source pops back into view), followed by a normal peak and subsequent decay to the afterglow region. (Other eclipse effects, such as dips in the peaks should be expected too.) These kinds of things are in fact observed. The article "A Strange Supernova with a Gamma-Ray Burst indicates a possible link between a Gamma-ray burst and the supernova SN 1998bw." [Was at http://www.eso.org/outreach/press-rel/pr-1998/pr-15-98.html]. According to the Ritzian hypothesis, the GRB could be the tip of the iceberg, so to speak, of the supernova. Emission and/or absorption lines for the fading SN 1998bw supernova should be checked to see whether or not they are sliding downward in frequency toward an unperturbed stellar spectrum. For another event of this nature see: Gamma-Ray Burst Afterglow: Supernova Connection Astronomy Picture of the day, 5 April 2002. See also: "Astronomers link X-ray flashes to gamma-ray bursts." [Was at: http://www.lanl.gov/worldview/news/releases/archive/02-038.shtml.] These findings are very consistent with the Ritzian relativity model. That is, stars that are brightest in visible light can have their spectra time-squeezed briefly up into the UV and X-ray region. Stars brightest in UV and X-rays can have their spectra briefly squeezed upward into the Gamma ray region. There should be lots of room for spectral regime overlaps. See Modeling the Geminga Gamma-Ray Pulsar and A Possible Connection between KONUS 790731 and Omega Geminorum. In principle, any close encounter of two stellar objects (or of a star and, say, a Jupiter sized object) could produce a pulse or burst of light in the sense mentioned above. Even comets, (reflected light in their case) at perihelion passage, should not be ruled out as potential sources of flashes. Kenneth Brecher gave a talk on testing special relativity using Gamma Ray bursts at the April 2000 APS meeting in Long Beach California. He evaluated the expression c' = c + kv where k = 0 for special relativity and k = 1 for the Ritz ballistic hypothesis. He states "If the SR second postulate is invalid, photons emitted simultaneously towards an observer from a source at distance L, characterized by internal velocities v (both towards and away from the observer), will arrive at the observer as a pulse of finite width dt, implying a value of k = (c^2/2v)(dt/L)." He used v > 0.1c, dt = 1.0 msec and a cosmological distance of 10^28 cm for L (GRB to observer). For these values we get k = 10^-20. Brecher says "This represents, by a factor of 10^9, the most precise test of the second postulate of special relativity to date." According to John Fox(4), ... source-to-extinction distance has to be used in calculations, such as in Brecher's special relativity test, rather than the source-to-observer distance. (For cosmological distances the former is generally very much shorter than the latter.) When we plug in the extinction distance, as estimated from the Crab pulsar light curve (see the main article) L=0.93*10^10cm, (which is approximately one fourth of the Earth-Moon distance) we arrive at a much fuzzier result for this SR test, i.e., k=1.6*10^-2. The author has not checked on this yet, but if one or more GRBs become detected within the (line-of-sight) angular confines of, say, the Coal Sack or some other extended opaque dusty region in our galaxy then it would seem presumable that the source(s) of those gamma rays will be between us and the dust cloud. With regard to the redshift information that seems to place GRBs at extreme distances, readers are enjoined to look over a rather sophomoric but sincere essay on an alternate take on redshift. See Cosmological Redshift. See: 'Local' gamma ray bursts may solve a mystery or two" NASA-GSFC News Release, Posted Jan 22, 2002. A scan for "gamma ray bursts" at the arXiv.org website led to a 22 February 2000 abstract by Charles Dermer and Markus Boettcher, titled Flash-Heating of Circumstellar Clouds by Gamma Ray Bursts. The search for such a phenomenon might be considered as an experimentum crucis for the Ritzian hypothesis versus the standard model. The ScienceNow article Fierce Flash, Strange Star summarizes a paper in the 9 July 2001 edition of Physical Review Letters (reference to follow) which describes two mysteriously bright gamma ray flashes, whose blasts failed to shred the source neutron stars. Based on these failures, it has been hypothesized that maybe the two objects involved were quark stars, which are thought to be much better glued together than neutron stars. The Ritzian interpretation of the events could be that no explosions occurred, and therefore no mystery. The word could is used here on purpose. Before Ritz can be cheered, it will be necessary to determine if binary encounters of some sort were involved in both flashes. There is a report, on page 246 of the 20 April 2002 issue of Science News, which deals with NASA evidence which may further point to the possibility of strange stars with novel forms of matter. Pros and cons of the idea are discussed. In one case, a revised distance measurement to one of the stars in question is said to remove support for "an extremely soft equation of state." An abstract for the paper dealing with this latter claim can be found at arXiv. 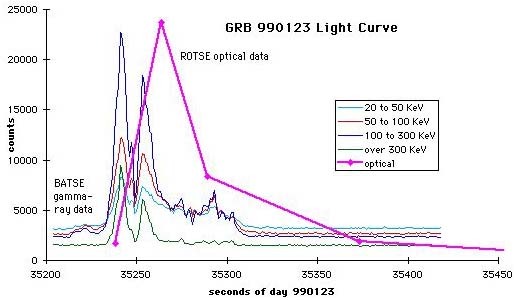 Here are light curves for GRB 990123. According to NASA (See: Autopsy of an Explosion.) This was the first gamma-ray burst for which a concurrent prompt visible light curve was recorded. 24 April 2002 - SpaceFlight Now. Evidence for the Galactic Origin of Gamma-Ray Bursts - B. M. Belli - Istituto di Astrofisica Spaziale, CNR, Italy. (1) R. Tolman, Phys. Rev. 31>, 26 (1910); ibid. 35, 136 (1912). (2) V.I. Sekerin, Contemporary Science and Regularity in its Development, 4, 119-123, (1987) Tomsk University (In Russian.). For an English translation, see http//www.datasync.com../sekerin.htm. (3) Compton Observatory BATSE Second Burst Catalog, Compact Disc, Disk 1, USA_NASA_COSSC_BATSE_0002. (4) J.G. Fox, Am. J. Phys. 33, 1, 1965. (5) E. Waxman, Phys. Rev. Lett., 75, 386 (1995); M. Milgrom and V. Usov, Ap. J., 449, L37 (1995). (6) W. Ritz, Annales de Chimie et de Physique, 13, 145 (1908). See English translation at: Critical Researches on General Electrodynamics.